Dimensions: 5 Ft X 6 Ft.
Acrylic Painting with Airbrush Canvas on stretch frame. 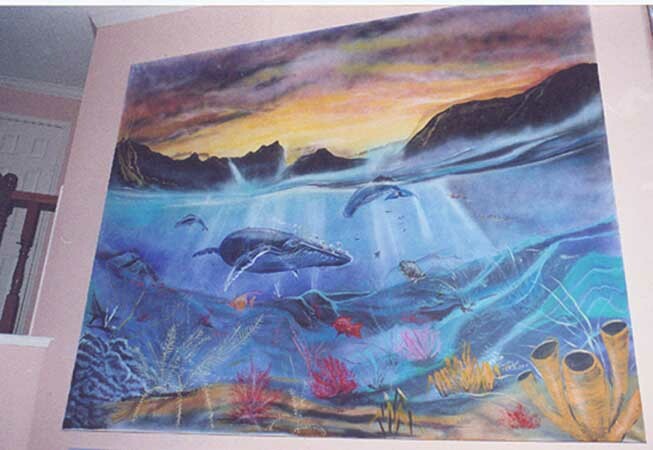 Houston, TX: Back in 2002, Artist Ray Gatica, from Humble TX., was commissioned by a client in Katy TX, above, to create an underwater seascape mural. The size was specific, because it had to fit in a 5 Ft. (H) X 15 Ft. (W) wall niche behind the bed in the bed room. The subject was exciting for the artist because of the colors and subject matter it was also challenging creating the underwater movement. In the canvas painting, Gatica used reference material (photos, post cards, etc.) and imagined himself underwater to be able to create and simulate the underwater motion and movement. The painting resemble Chris Reese Lassen's style painting. 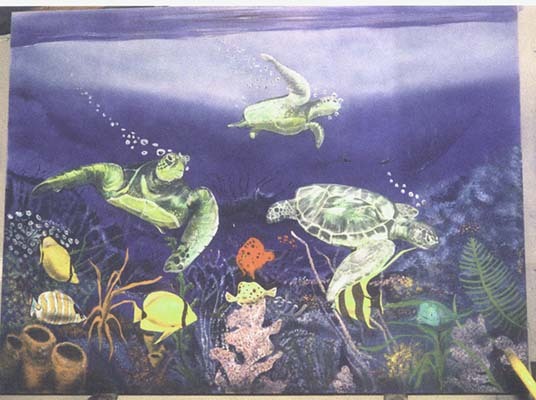 This was the first of this style of work for Gatica, but with over twenty years experience in painting he was able to adapt his style to create the underwater motion filled paintings. Gatica titled them 'Underwater Frolic I (above), and, II, III, (at left) because of the whimsical colors and how the fish seemed to be having fun in the painting. The piece was exciting and included a lot of detail and motion, assorted colorful coral, plant life and included assorted sized fish, that seemed to enjoy it all as they played and "frolicked" around as they go through their underwater existence. The above painting was the first one. It was the first painting of this type, for the artist. 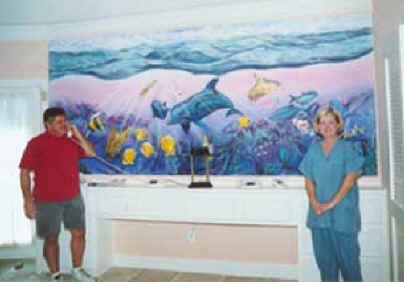 The client was so pleased she commissioned the artist to create three more large canvas murals. The canvas paintings were painted at the artist home based studio then transported to the clients home and installed. Gatica wound up creating three more canvas murals for the client. 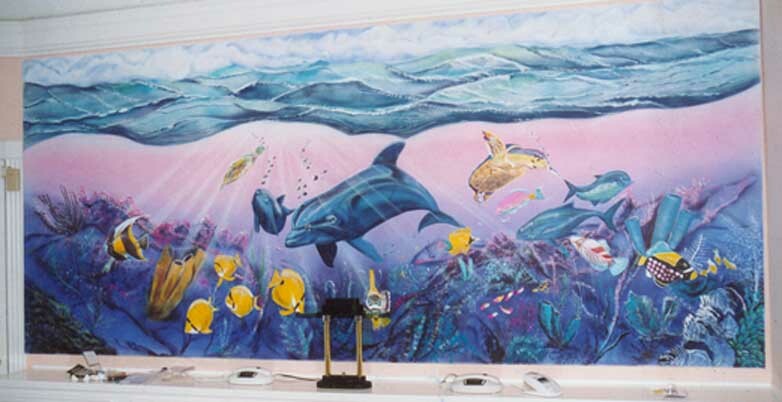 He also painted, in the same vane as the canvas pieces, a 6 Ft. tall wooden sculptor depicting dolphins jumping out of he water that had a base of coral and underwater rocks. Most of the time Gatica starts the large paintings with traditional brushes and finally, applies overlays of washes and color with the airbrush to soften shadows, highlights and edges, and to add special effects, typical of the airbrush. Go to read the Newspaper article/more on this. We have also done this style of works at restaurants, health facility. 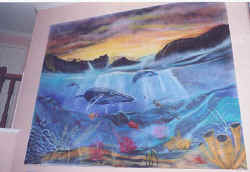 More of our art can be seen at www.MuralsAndBigArt.com.